They may seem like a relic of the past, but pay phones still exist – in fact New York City has 12,800 of them. With the franchise contracts on those phone set to expire in October 2014, the city is launching a pilot program to repurpose those booths with some modern day functionality. 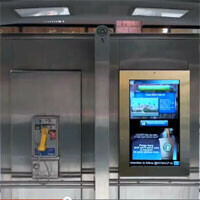 Next month the city plans on outfitting 250 old phone booths throughout the five boroughs with 32-inch “smart screens” featuring Internet connectivity. The ad-support screens will provide access to local neighborhood information such as lists of nearby restaurants, local store sales, traffic updates, landmark information, and safety alerts. They will also feature an on-screen link that will allow users to file complaints or request city information. The hope is to eventually add additional connectivity that will allow users to use Skype, log onto email accounts, and use the booths as Wi-Fi hotspots. If the thought of sharing a tablet with the entire city of New York skeeves you out, the franchisee that is installing the screens, City24x7, claims that they will be more sanitary than an ATM. City24x7 CEO Tom Touchet says, “They’re built to be cleaned with a jet hose. They’re waterproof and dust-proof.” As anyone that’s walked around NYC knows, there are a lot of things they are meant to be cleaned, that aren’t, so we’ll take that one with a grain of salt and wait and see. The screens will not cost the city anything and after the trial period, the city will take a 36% cut of all ad revenue from the devices. According to a city spokesman, the city currently collects approximately $18 million a year between coins and advertising on pay phones. According to the NYPost, the city is also replacing underground pay phones in the subway stations with computer kiosks that will feature 22-inch touch screens with camera for video conferencing, and electrical outlets that will let people charge their phones and other gadgets while on the go. This is great until the homeless start peeing on them. I hope they are waterproof. Um...can't you read? In the 5th paragraph there is a line that reads "City24x7 CEO Tom Touchet says, 'They’re built to be cleaned with a jet hose. They’re waterproof and dust-proof.'" I can not read. Somehow I navigated to this site, registered, and typed a comment without ever being able to read. I feel like I've accomplished a lot. I should have put, I hope they are "water" proof. Or maybe just put "urine proof". Thank you for pointing out my glaring mistake. I have not only embarrassed myself, but the State of New York school system. You are a gentleman and a scholar Skymitch89. Payphones should be eliminated. All they do is attract poor people and bring down property values. Did you ever think about reading your comments back to yourself before you press the "POST COMMENT"? Did you know there is a "CANCEL" button right next to it? Just waiting for the whole internet/electronic crash to happen. Too many people are going to electronic devices, more specifically internet connected devices, and I just cannot wait until someone puts out a bug that's supposed to do one thing but turns around and takes down or takes over like Skynet. Or an Electro magnetic pulse weapon. The Russians have developed a very effective one. They push a button,and we are all back to 1829. That means they're piss proof too. They could also incorporate curtains that could be pulled so the customers could use the touch screens for pornhub. Seems like a waste of money. The city has to pay for them because they aren't profitable. The city might make 18 million, but I bet it costs them more than that in repairs and service fees. Someone still has to pay a monthly service fee for the line and number. What are these going to cost? $2 a minute? I see this being a flop. I really don't see this happening at all in my opinion i mean how is Verizon going to pay all of these? Everyone either have a contract phone or pre paid. It's a great start for information display service and a good source of revenues for city from Ad-generated. But it looks like the old pay-phones trump the latest ones in energy efficiency. The old ones use energy when on call connection. And the new ones have screens and seem to be on for 24/7. Otherwise it'd be incredible if those use less energy than the old ones.